Now available with galvanised panels in selected sizes, ideal in environemnts where chipboard may present a fire hazard or where liquids are being stored that may damage the chipboard. The Speedy 1 Heavy Duty Shelving range is the original boltless shelving system already in use by thousands of homes and businesses for over 25 years. This long established design features strong 1.5mm premium steel C-section front & rear beams and L-section side beams, combined with matching L-section upright beams to provide you with the ultimate in strength and durability. Coupled with strong galvanised steel panels, Speedy 1 truly is the ultimate shelving solution! The design is rapid to assemble and can be put to use within minutes with the help of nothing more than a rubber mallet. All 1980mm & 2440mm high bays are supplied with 4 shelf levels as standard. Additional levels are available separately in all sizes. All bays up from 1677mm to 1980mm high can carry up to whopping 400kg UDL per level, whereas 2440mm high bays will carry a hefty 330kg UDL per level. 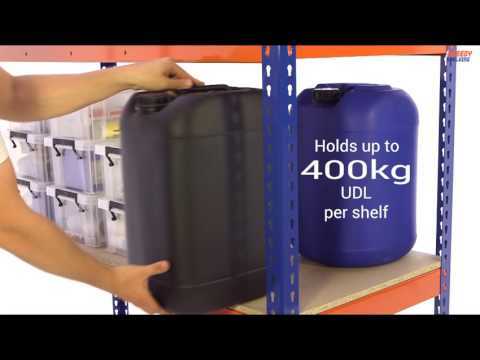 For even heavier duty shelving please see the Speedy 1 Super Heavy Duty Shelving range offering up to a massive 800kg UDL per level! Versatile and easy to construct, many size options to meet most demands. Good Quality. Industrial strength long term storage unit for use in external unheated garage. Very solid construction - will last for years !